While we pilots like to think of ourselves as being steely eyed professionals who are unemotional (at USAFA we often referred to ourselves as “rocks”), the truth is that, almost without exception, we are extremely fortunate, both physically and financially, want to promote aviation, compassionate and, until we retire, workaholics. Workaholics, by definition, don’t have time for matters outside of work. There is no free lunch. We have to pay “the piper” for our success with time. Time for family, community and ourselves. We also have the flying DNA, obsessed with aviation and the desire to promote aviation. Charles Lindbergh put it best when he said it was worth dying young if he could fly for 10 years. We are an oxymoron, frugal, aka cheap, (copper wire was invented when two airline captains spotted a penny at the same time) and generous. I won’t address the “cheap” but will the “generous.” Most of us are looking for a way to do good deeds and promote general aviation. I stumbled across the solution, Compassion Airlift. 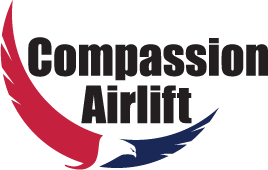 Compassion Airlift, based at Manassas Airport (KHEF), provides transportation, free of charge, to ill or injured people who, because of their infirmity, can only travel in the reclined position. It has been around since 1977 and has flown 2,500 patients over 1.5 million miles between every state west of the Mississippi. Until recently it was under the Mercy Medical Airlift (MMA) banner but became independent in 2015 when MMA ran into financial problems. Rather than let the Bonanza operation fold, their pilots took “the bull by the horns” and, together with the owners of the Bonanza Model 36, formed an IRS 501(c)(3) nonprofit corporation, and with their own funds continued providing free medical flights. It is the only stretcher certified Bonanza in the country. There are many injured and sick people who can’t tolerate the sitting position more than a few minutes, if at all. Included in this group are many of our combat injured military men and women. This is where Compassion Airlift comes in. It provides these people with an opportunity to recuperate, or in some instances, die, in the geographic location most advantageous to them, surrounded by love ones. Compassion Airlift is only for people, not pets. The operation is very “lean.” Donations go a long way. Here’s how they do it. Safety is paramount First, no paid staff, all volunteers including 5 PIC and 6 F/O pilots. They normally fly with two pilots when carrying a patient. Each PIC must have a minimum of 1,200 hours flight time and a commercial/instrument rating. Most of the PICs have their ATP and flight instructor certificates. The F/O must have 250 hours flight time and a commercial/instrument rating. PICs must have an annual flight check, FAA Flight Review & IPC in the last 12 months in the organization’s Bonanza administered by their chief pilot. Both PICs and F/Os complete annual ground training using Computer Training System’s FAR Part 135-oriented computer-based training system, supplemented by monthly pilot meetings focused on safety, standardization and training. Jeppesen provides electronic charts while Computer Training System provides training at a discount. All maintenance is performed timely and professionally but at regular shop rates. Although Compassion Airlift receives monetary support from local churches and organizations such as Rotary and Elks, the pilots and owners still must reach deep into their pockets to keep the organization running. Most of us aren’t aware of how prohibitively expensive this vital service is if bought on the open market. The only alternative to Compassion Airlift is to charter an air ambulance. Because air ambulances operate under an air carrier certificate, the Airline Deregulation Act (read “gouge the pax”) prohibits states from limiting or regulating cost. Consequently, charges can, and do, vastly exceed health insurance reimbursement or workers comp payments. By keeping all cost minimized, Compassion Airlift, fills this very important role. Without it, people can’t recuperate or receive medical attention at an optimal location. This service helps make a very difficult situation more tolerable. Because donations have fallen, the dedicated pilots have personally been paying for most of the expenses “to keep the lights on” including paying for gas. These are tough times. We, the GA community can pitch in and help. C/A transported Barbara, a 58-year-old stage IV cancer patient with a broken hip bone due to cancer, from near her home in Pennsylvania to a town near Cleveland. When C/A arrived at the GAs airport a little early, there was no one around. Soon a caravan of cars arrived with Barbara and her family and friends. Barbara was in a lot of pain whenever she was moved including when she was placed onto a removable stretcher and then into the plane. It was an emotional farewell because it was likely Barbara and her sister would never see each other again. The arrival GA airport south of Cleveland was small and deserted. The low overcast skies were a talisman. Barbara’s son came with an ambulance to pick her up. Barbara got to spend three weeks with her son before she passed away. Several years ago, C/A transported a soldier recuperating from an IED injury from Walter Reed National Military Medical Center to Jackson, Michigan to be home for Christmas. It had been three years since he had been home for Christmas and would be at Walter Reed for an extended time. C/A arrived with the soldier in Jackson in freezing cold weather on Christmas Eve to a large community welcome by the Army Reserve and multiple fire departments and sheriff’s officers (see pictures above). C/A transported him back to Walter Reed on January 3rd. C/A transported an 18-year-old with Duchenne Muscular Dystrophy (a rare genetic form) and his mother from Shirley, New York (which provided the ambulance to the airport), to Martinsville, Virginia. The charge for an air ambulance would have been $20,000. Instead, C/A stepped in and flew him, at no charge. The cost to C/A was $1,890. A final exemplar of what C/A does is when they transported an elderly mother accompanying her comatose daughter from Boston to their home in Lynchburg, VA so that the children of the comatose daughter could be with their mom for a while before they let her go. The best price the family had been quoted for air ambulance transport was $15,000. C/A—as with all of its flights—performed the service free of charge. Contributing to Compassion flight is a win, win, win, win. You help those in need, promote general aviation, get a tax deduction and have the satisfaction of doing good. You’re welcome!